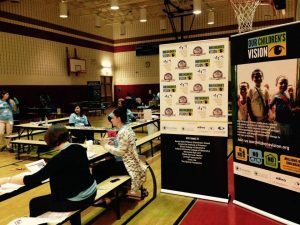 Our chair, Carolina Kunnen, travelled to Indiana to provide free vision tests to elementary school students and youth baseball players from Gary, Indiana for World Sight Day 2016. The vision event was a collaborative initiative from Our Children’s Vision and the Baseball Players Trust, which partnered up with The Optical Foundation, Illinois Eye Institute Princeton Vision Clinic, Indiana University College of Optometry, Illinois College of Optometry, Moses Eyecare and Benavente Eyecare to make the event possible. Former Major Leaguers LaTroy Hawkins and Kenny Lofton assisted with the eye testing and participated in question and answer sessions with the youth. Together, we tested almost 200 pairs of eyes and provided 54 children with glasses.